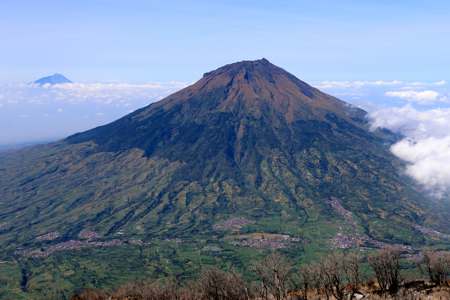 A good point of reference is the saddle between Sindoro and Sumbing. A highway is running across this pass. 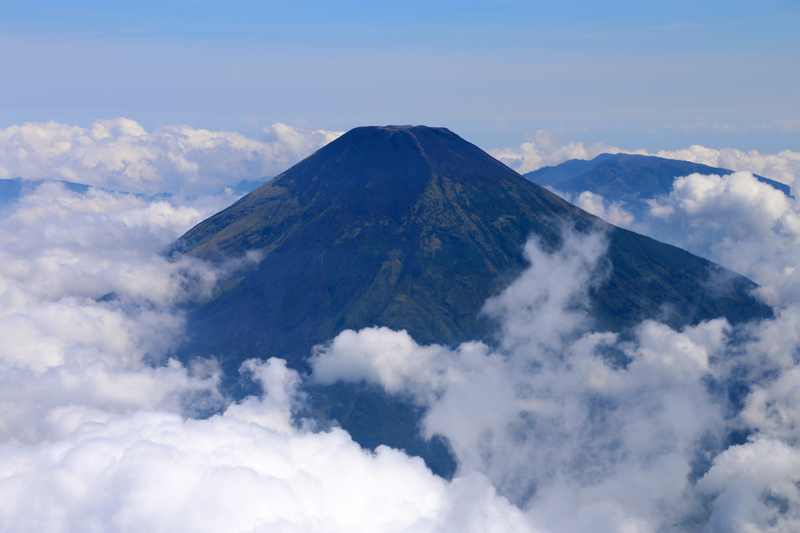 Near its highest point, turn towards Sumbing and locate the Registration office. This location is S07.35021, E110.02855, elevation about 1400 meter. The trailhead is located near the end of this street, a bit more uphill, at location S07.35417, E110.03454, elevation aboout 1470 meter. The first part of the route follows a farmers road, first left, then uphill. 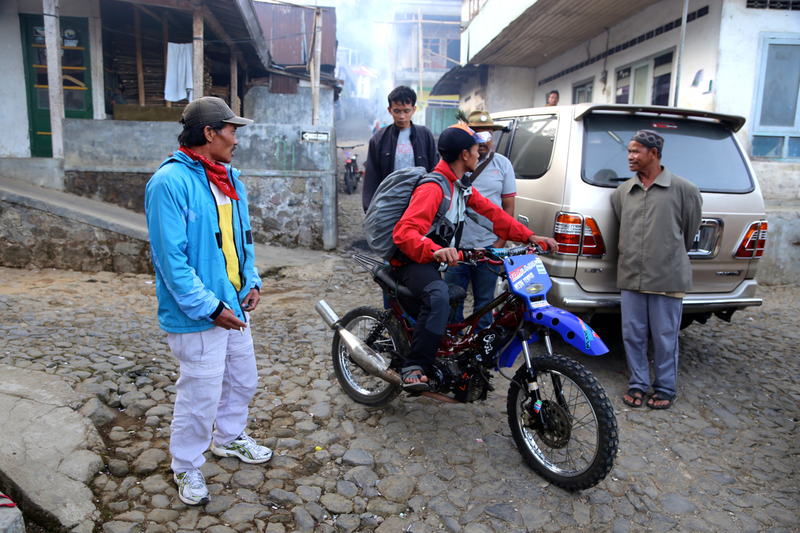 Transportation by motorcycle is possible (cost 25.000 in 2015). The road ends at elevation 1930 meter, location S07.36216, E110.04935. The trail continues directly from the road. It is quite easy and gentle uphill in the first part, then follows a steeper section that may be cumbersome (slippery) if wet. 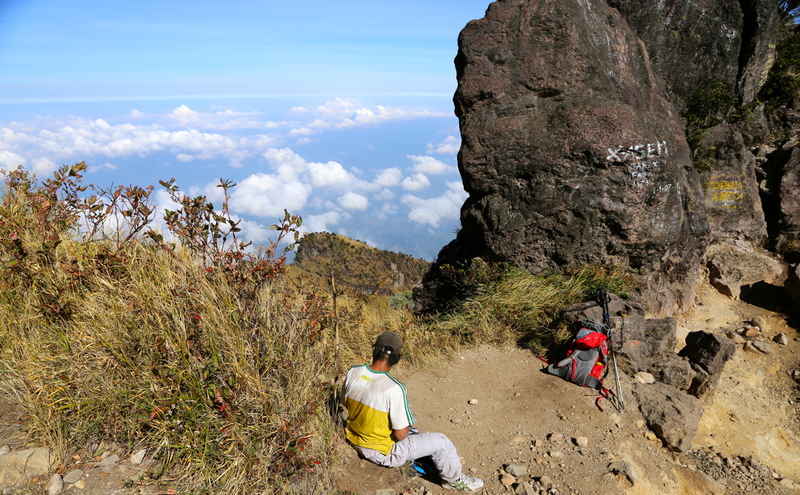 Above here, the route stays on a nice ridge and there are several spots suitable for camping. With stead climbing, the route comes up to some steeper rock that is bypassed going left, then regaining the ridge higher up. The final section up to the rim is going more or less straight uphill. 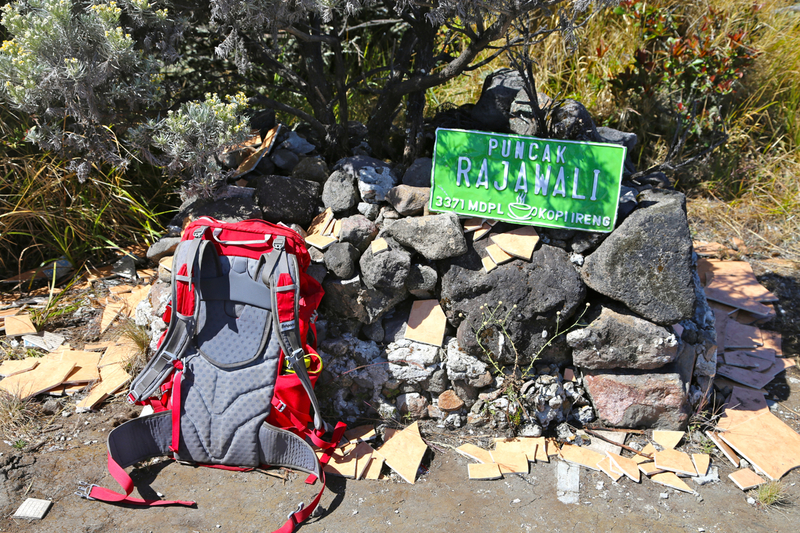 Before, but very near the crater rim, you will hit a sign that indicates a trail fork. 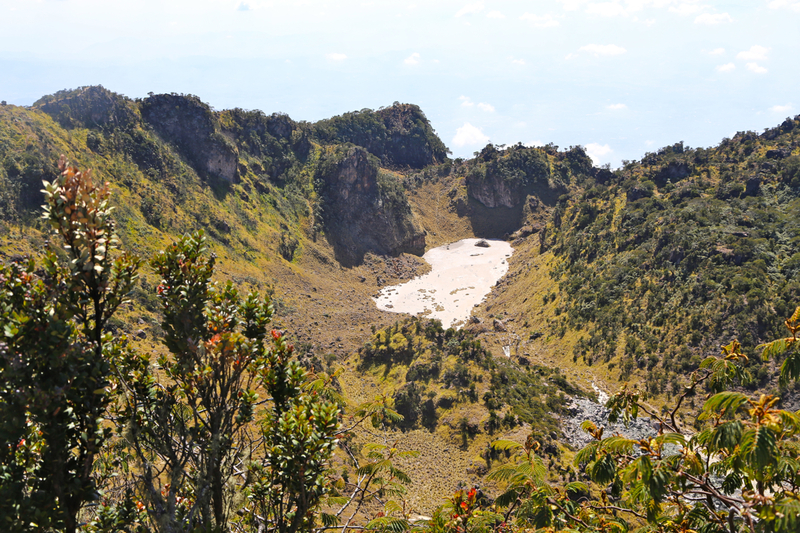 In order to get to the highest point, turn right and follow a clear trail that runs horizontally somewhat below the crater rim. Soon, this trail emerges onto the rim itself and the terrain ahead comes into view. 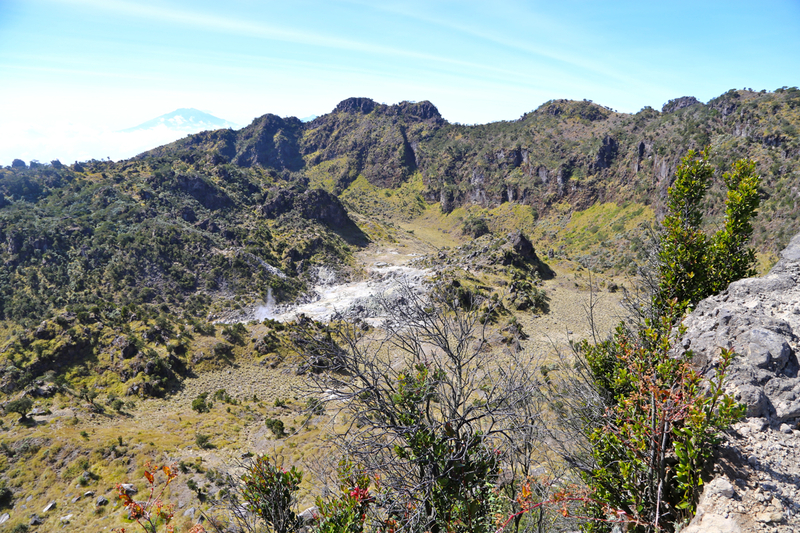 There are two local tops further along the crater rim. 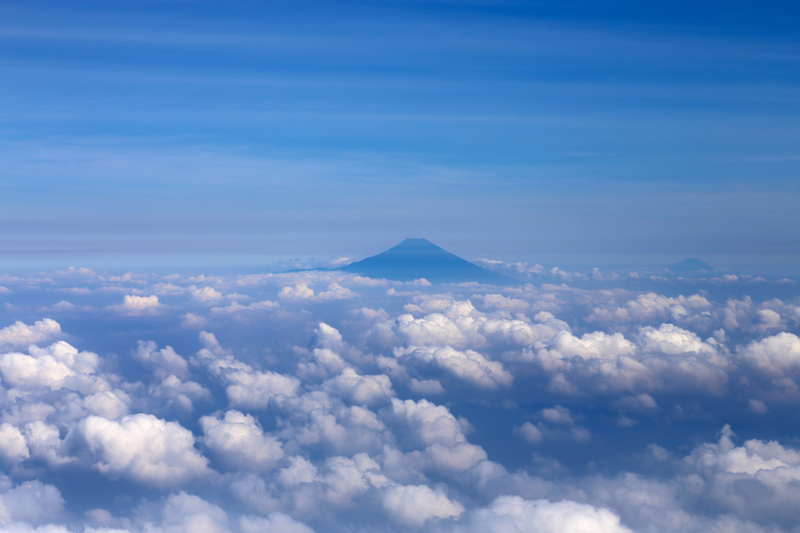 The highest point is on top number two. At the base of the first top, scramble (very easy) up left, then follow a ramp downslope to your right. The path will then take you easily to the first local top. 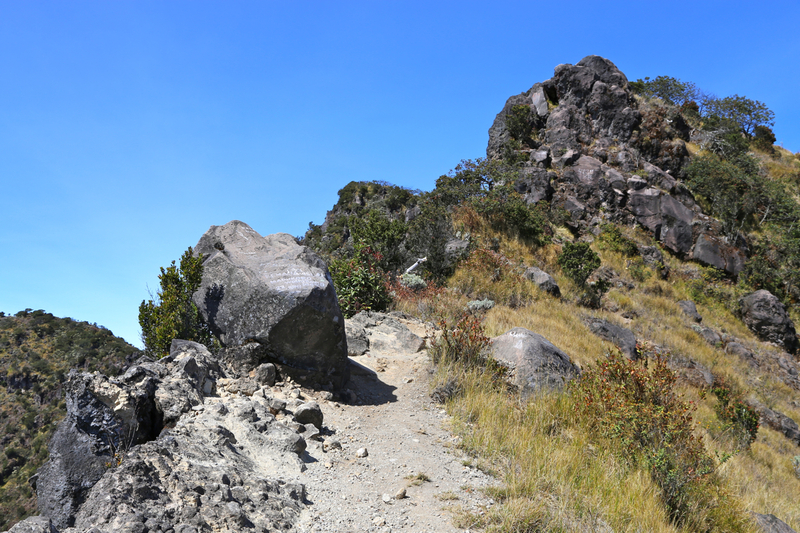 From here, follow the path down towards the saddle that separates the two tops. This saddle is wide and gentle, however, a rock-band creates a difficulty at the very end of this descent. Approaching from above, the steepish section leading down to the saddle looks worse than it is. Still, care is needed here as the terrain is sloping out and handholds are less than perfect. To reverse this section, ie. 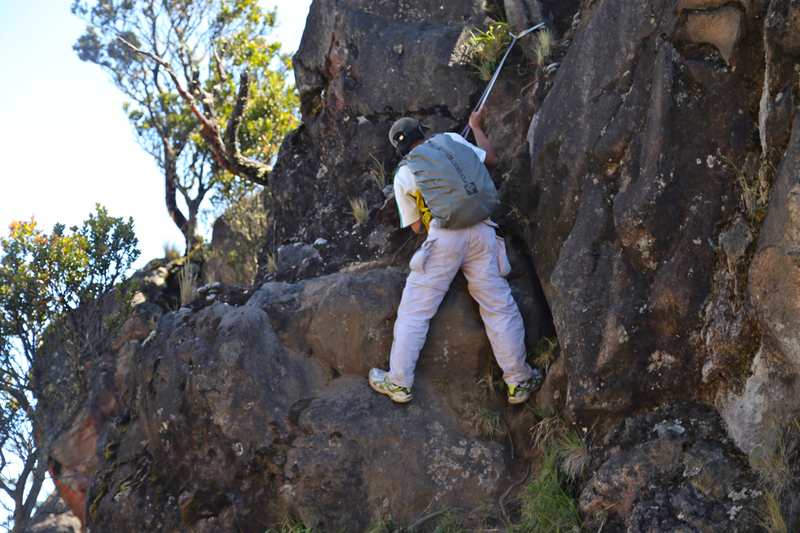 to climb back up, is considerably easier as you then better see where you have good footholds. This is the crux of this route, YDS class 4, although a very short such section. Continue across the saddle, then follow the vague trail (very few people go here), as it contours around on the right before reaching easier terrain where the path can go straight uphill to the summit. 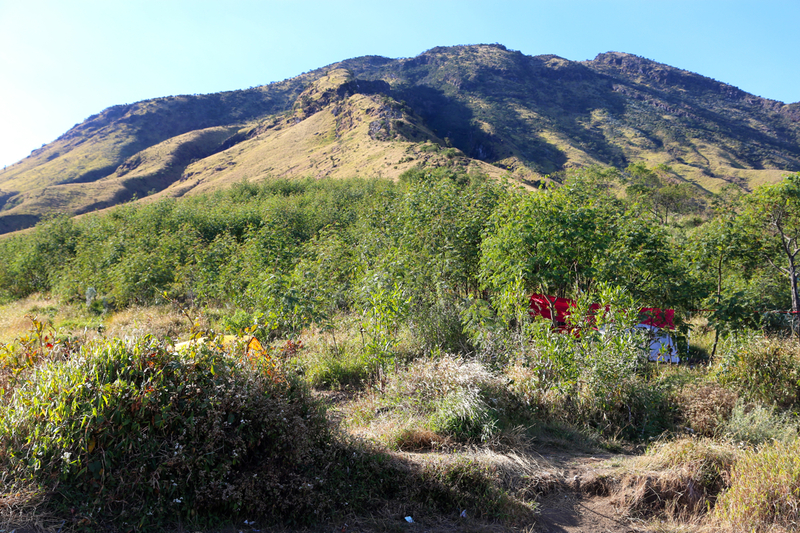 I left my "Base Camp" at Mesastila at 0530 and arrived at the registration office around 0630. 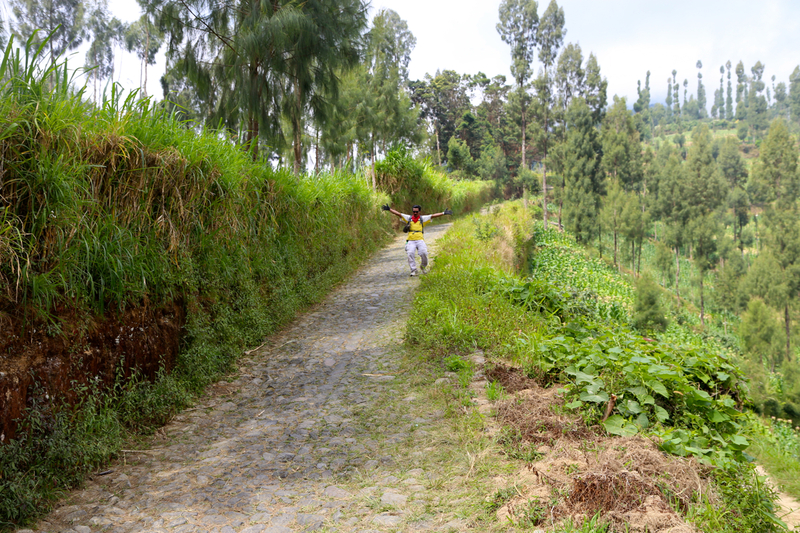 The climbing fee was 10.000, then another 50.000 to get a motorcycle ride for myself and my guide to the upper end of the farm road. 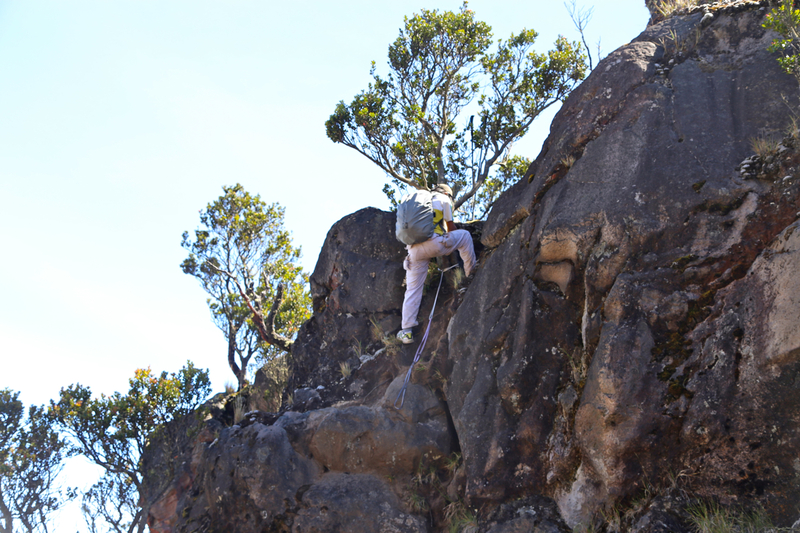 Having read that almost nobody climbed the true summit because of a technical difficult section, I decided to have a guide along on this trip. Not in order to show the route, but rather to have company. It is better to be two people when negotiating a bit demanding terrain. 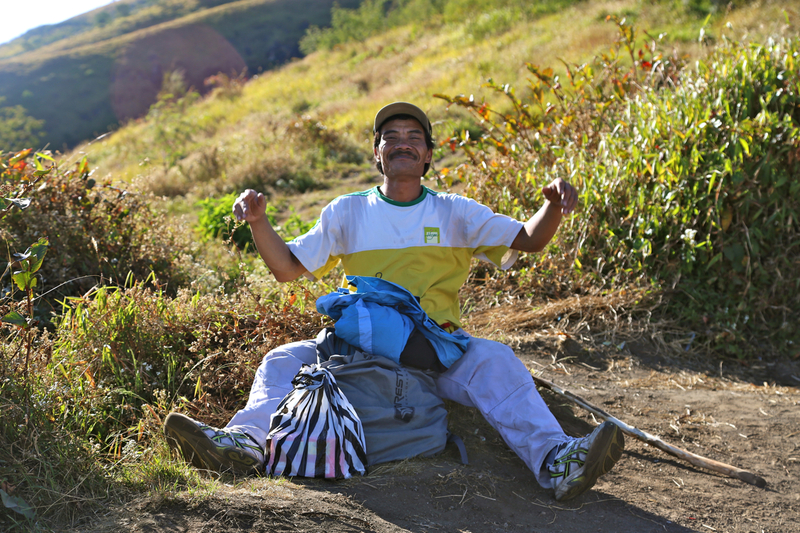 My guide was Marjo Pitut, a very friendly guy that certainly fullfilled my expectations. 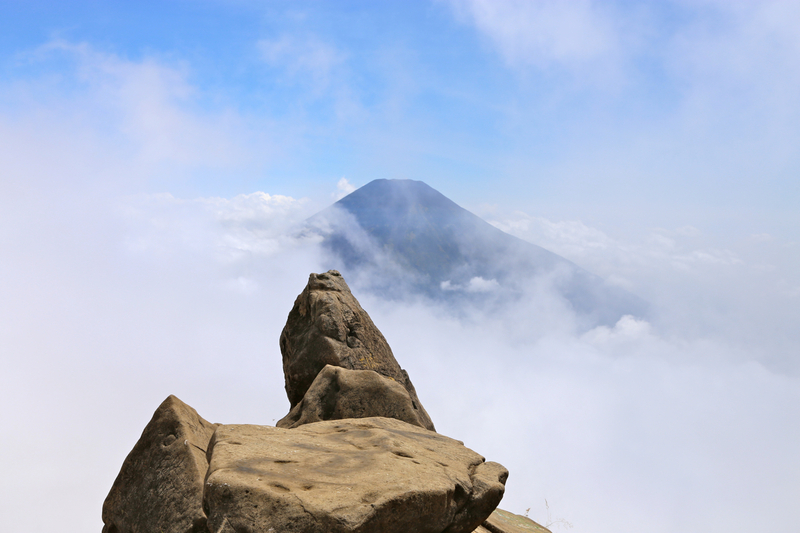 As it turned out, he had never climbed to the summit before, and he did not know the route or what kind of difficulty, but that was of no consequence as far as I was concerned. We started hiking at 0705 and with a few breaks for water, reached the rim at 0945. Proceeding along the rim carried no problems until I came to the crux section and looked down. Far enough that one would not like any issues here. Marjo came right behind me and showed some signs of slight concern. A solid tree stood right at the top, a perfect anchor. I pulled out 3 slings from my backpack, this was just exactly what was needed to protect this downclimb. I could see that Marjo was more happy, when he asked about the strength of my slings. I told him that they were "indeed very strong" and proceeded to climb down first. My weight being at least 20 kg more than Marjo, he seemed quite happy. Soon, he was coming down with no more concerns. 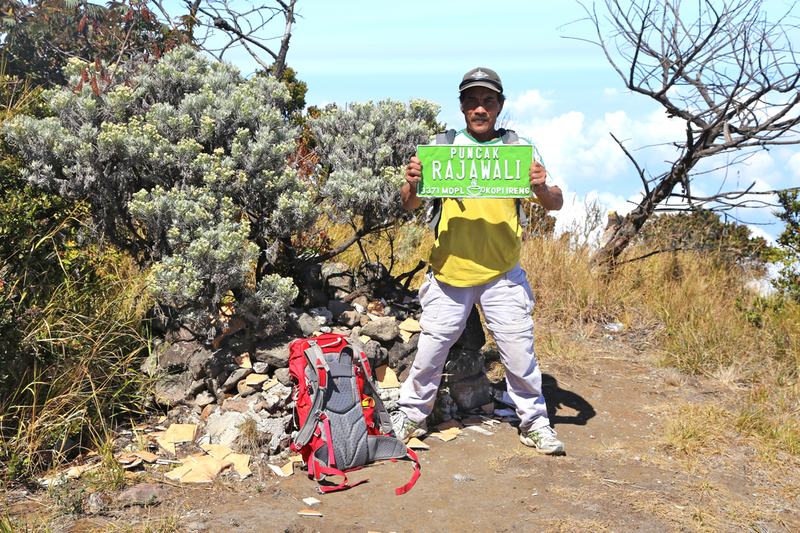 The rest was easy and we arrived at the summit at 1015. Marjo was as happy as me, he took many pictures and looked around to see the views in all directions. We stayed at the summit for 30 minutes. There were many people at the rim closer to where the trail came up, but nobody else attempting to come up here to the highest point. 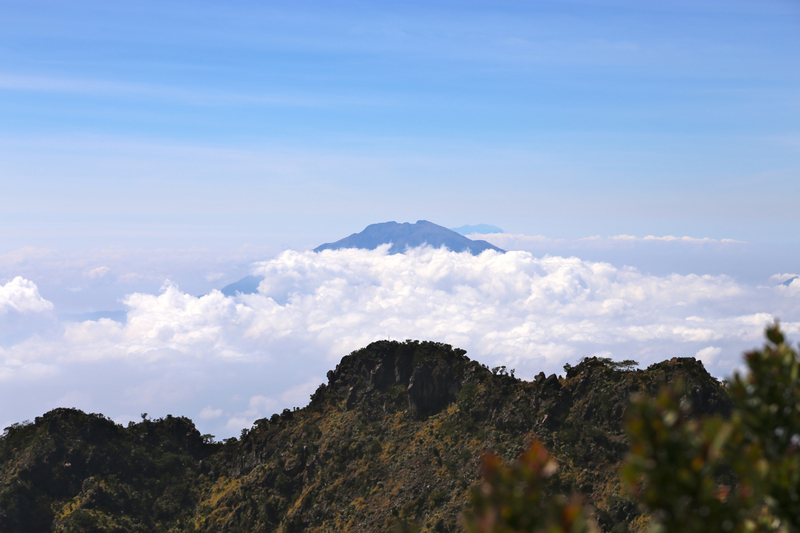 We had good views across to Slamet, also back down into the crater of Sumbing, a pretty large, and somewhat stretched crater. 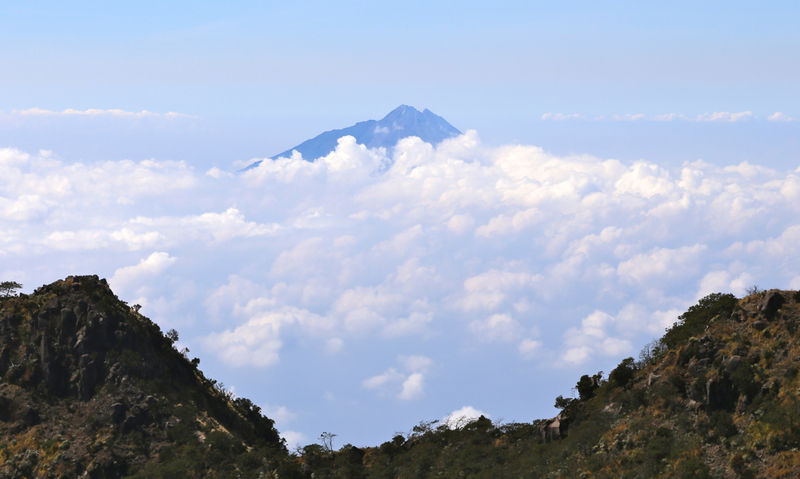 Also, the view across to yestedays climb of Merbabu with its neighbor Merapi. 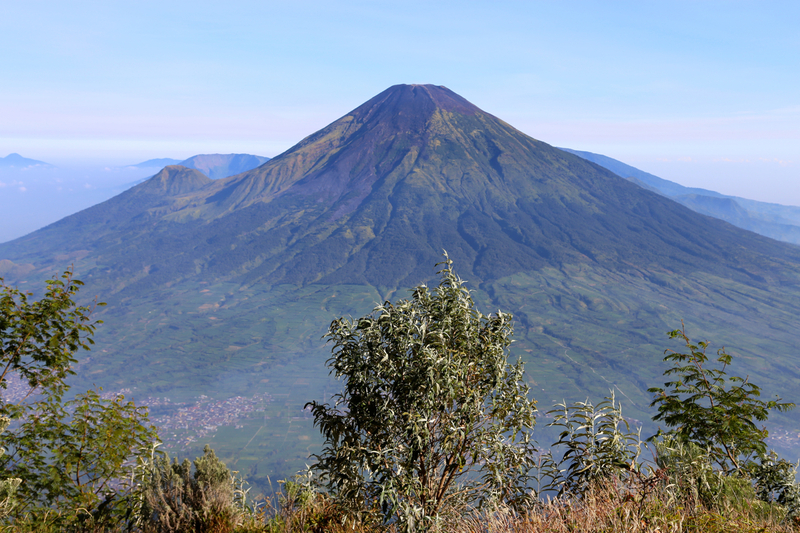 Not to mention the little brother, Sindoro, that I climbed 2 days ago. We returned to the rim access point in 30 minutes. 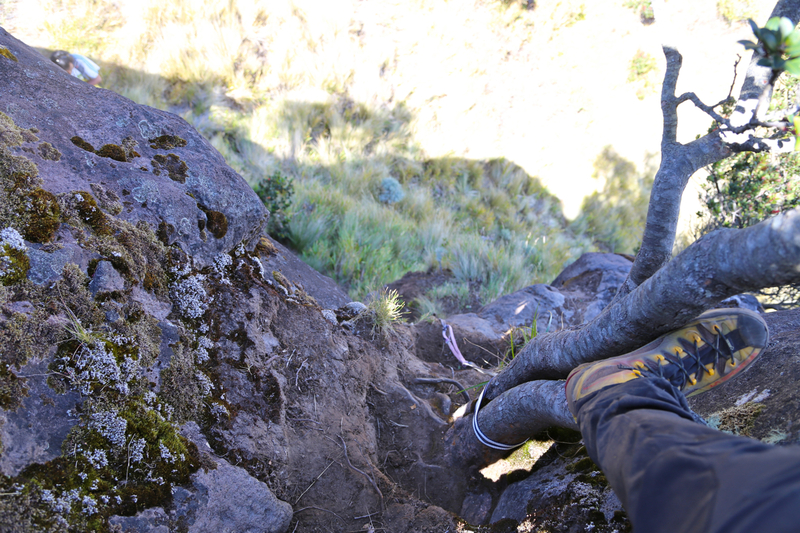 The climbing back up was considerably easier (as it often is), since coming from below shows where to place your feet. 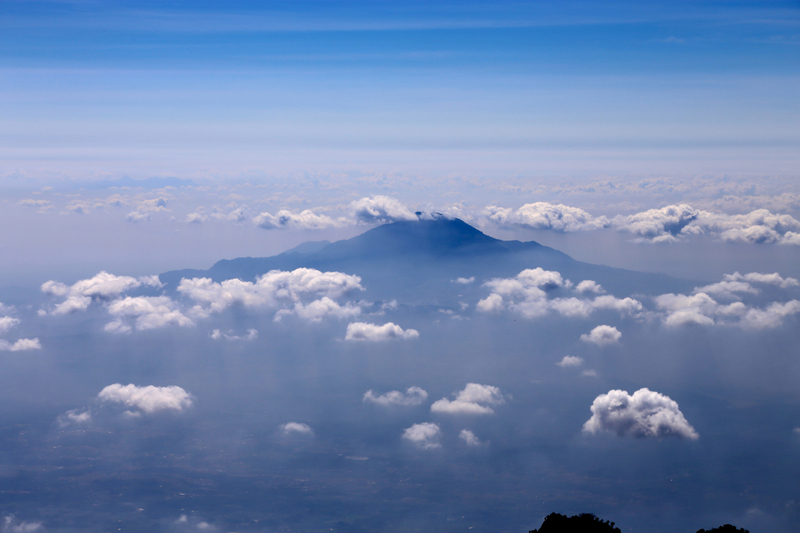 The clouds were now rising and even Sindoro began to disappear. Proceeding down, we reached the starting point at 1300, then another 35 minutes to walk down the road to our car and driver. 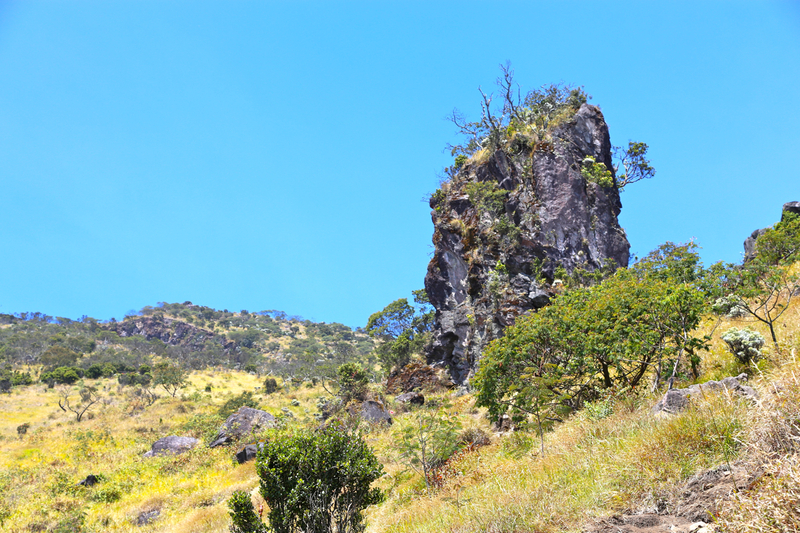 Gungung Sindoro, as seen on the way up Sumbing. 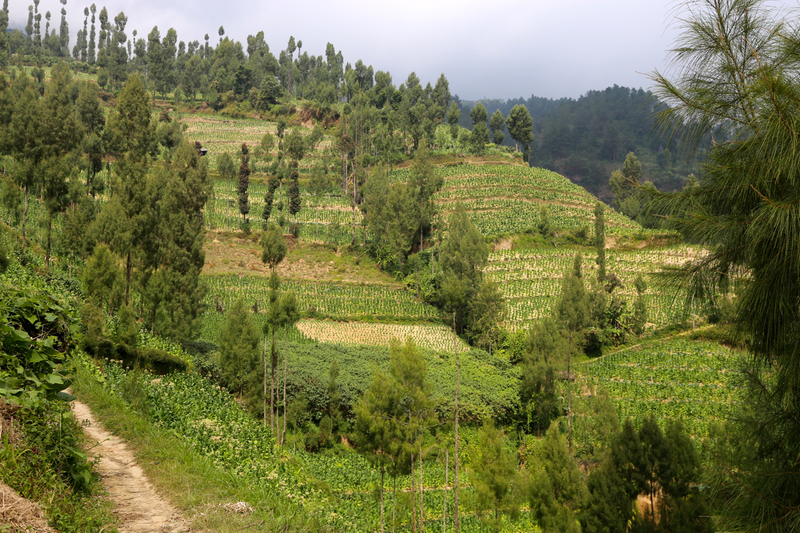 Agriculture, on the lower slopes.